In February 1987, leukaemia claimed the life of 14-year-old Paul O’Gorman. Within weeks of his death, Eddie and Marion started fundraising. Just nine months later, another devastating blow struck the family when Paul’s sister, Jean, was also killed by cancer. 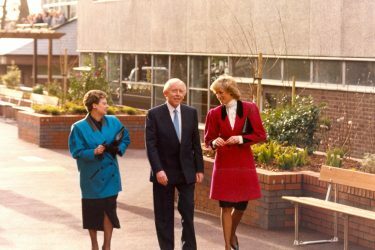 In November 1987, just days after Jean’s death, their parents, Eddie and Marion O’Gorman, met Diana, Princess of Wales. Deeply moved by the double tragedy, she personally helped to establish this charity. Children with Cancer UK is a member of the Association of Medical Research Charities (AMRC). We are also a member of the National Cancer Research Institute (NCRI), a partnership of UK cancer funders. The AMRC sets minimum standards of good practice to which member charities must adhere in their grant-making, including policies on peer review. NCRI is a UK-wide partnership between the government, charity and industry. It promotes cooperation amongst its member organisations for the benefit of patients, the public and the scientific community. The O’Gorman family was shattered when brother and sister Paul and Jean fell victim to cancer within nine months of each other. 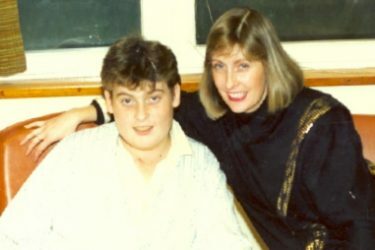 Always a caring boy, Paul asked his parents, Eddie and Marion O’Gorman to promise to help other children with leukaemia. Paul died in February 1987 aged just 14 and only nine weeks after his initial diagnosis of leukaemia in 1986. His sister Jean, despite her own battle with cancer, had started to raise funds for children with leukaemia in her brother’s memory. Jean died just nine months later that November and days after our first ball, which Jean helped to organise. In November 1987, just days after Jean’s death, the O'Gorman family met Diana, Princess of Wales. Deeply moved by the double tragedy, Diana personally helped the O’Gorman family to start the charity. 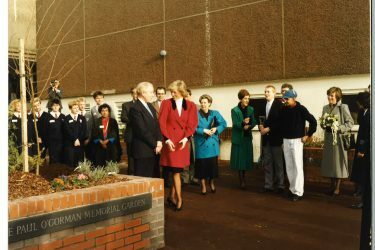 She kindly inaugurated the Charity on 12 January 1988 at Mill Hill Secondary School. 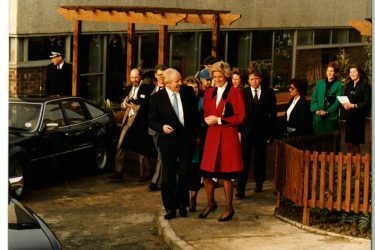 The Princess continued to support us and was a source of inspiration and remained interested in our work, keeping in touch and giving encouragement to our wonderful supporters until her untimely death in 1997. We were greatly enriched by the friendship of Diana, Princess of Wales and shall always remember her with fondness, pride and infinite gratitude. Through the unceasing efforts of Jean and Paul’s family and friends, what began as a small memorial charity has evolved into Children with Cancer UK, a major force in paediatric oncology. Since 1988, thanks to your support, we have raised over £220 million to help the fight against childhood cancer. Research, improved treatments and support for children with cancer and their families are still much-needed. Every week in the UK, more than 70 children and young people are diagnosed with cancer. Every year we invest more than £4 million in new research across the full range of childhood cancers. We currently have more than 60 projects under way at leading centres around the UK. This includes research that aims to drive up survival rates in even the hardest-to-treat cancers and to reduce the burden of toxicity for young cancer patients. With your continued help we can continue our life-saving work. Our small team is united by a common goal – to save and improve young lives. Everything we do revolves around this. Our charity is governed by our Board of Trustees. Over the last more than 30 years Children with Cancer UK has funded over 200 research projects and helped fund research centres and respite homes across the country. We’re proud of what we’ve achieved and would like to tell you more about our story. Read about the impact we've made! Meet Bella-Rose – one of our hero patient stories!